Launceston flanker Tom Rawlings believes former boss Jon Hill's return to Polson Bridge with Exmouth will help lift the struggling side on Saturday. Rawlings played under Hill, who led Launceston to the old National League One during his six years at the club. Exmouth have already been relegated from the National League Two South, while Launceston are in the drop zone. "That extra 10% will come out purely for the occasion, and because we know who is coming down," Rawlings said. "He is a respected coach in the south west. I've played and led the team under Jon, and I think that will rise us that little bit more [for the game]. "It's a game we need to win, and not just because of where we are in the league and how our season has been unfolding - it is a local derby for us." Rawlings said Launceston would be looking to bounce back strongly after slipping to third-from-bottom with defeat at second-from-bottom Bournemouth last week. 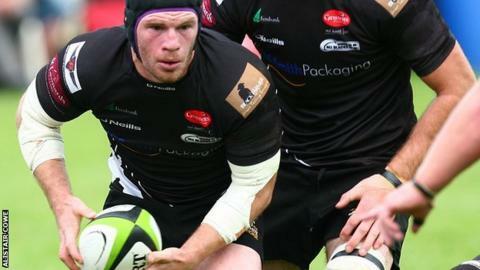 The Cornish All Blacks had a 14-point lead just before half-time at Bournemouth before the home side scored 18 unanswered points to intensify Launceston's relegation fears. "We want to put a few wrongs right this weekend," Rawlings told BBC Radio Cornwall. "Somehow we threw it away [against Bournemouth]. It's important that we are on the field for 80 minutes, not just physically, but mentally as well. "We have to be prepared for everything they throw at us. "It's a big game and we need points to claw our way out of the relegation zone. There are teams in sight around us who we can catch and overtake."